This is actually an update of a tip from David Clark, the nationally known horticulture speaker who teaches at the Buffalo and Erie County Botanical Gardens. Winter sowing is great because it gives us gardeners in Western New York something to do when it’s cold and snowy out. You plant hardy seeds in old milk jugs or other containers and set the containers outside now. The seeds will know when they should sprout in the spring. This is also great if you want to start lots of seeds, but don’t have as much room inside on your window sills as you would like. Note: It’s too early to start seeds inside now. The seeds will germinate, but the sprouts will get leggy and weak before you are able to transplant them outside. Will opaque milk jugs work for winter sowing? I had first tried winter sowing a few years ago with the translucent milk jugs that we used to get in stores around here. Find the directions for the milk jug greenhouse here. I had good results, but wasn’t sure if it would work with the newer opaque milk jugs, so I tried it last winter. This does work with opaque milk jugs! I tried it last winter and by spring I had tomato seedlings. I worried that they were coming up later than they should, but our spring was cold, so they were probably on time. I’m not sure why it worked with the opaque milk jug, but it did. When the top and bottom halves of the opaque jug were closed, they didn’t fit together as neatly as they did on the translucent milk jug. Maybe that let in enough light for the sprouts. If you don’t trust the idea of using containers that are opaque, there are lots of other options. Reader Phyllis Lobbins uses the containers that come with baby spinach leaves, spring mix or other lettuce mixes. She also uses the larger strawberry containers and some take-out containers. Other people use two-liter pop bottles, water jugs and the containers for leftovers with the colored translucent lids. As long as the container holds two to three inches of soil and has a transparent or semi-translucent top, it can be used, she said. You might want to think about adding holes for air ventilation to some of these containers. With the milk jugs, I left the cap off, which provided plenty of air circulation. However, if you’re using a container with a tight-fitting lid, I would suggest poking holes in it to allow air to circulate. 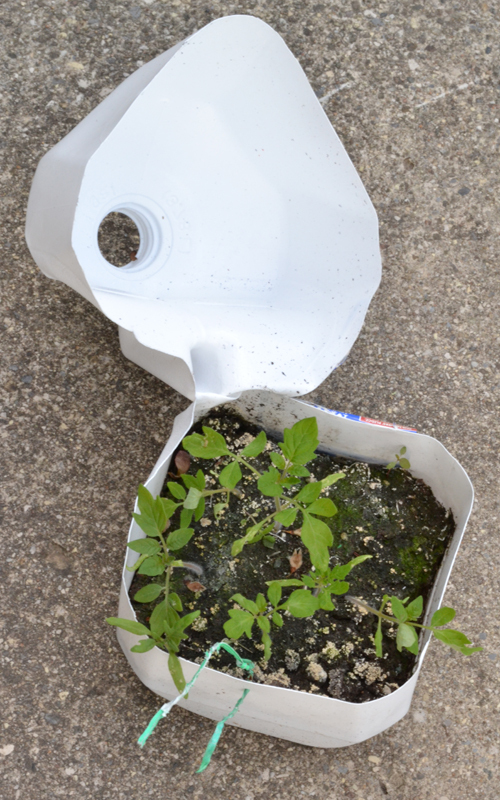 Many people suggest poking holes in the bottom of your container for water drainage. I didn’t do that when I used milk jugs and it worked fine. What kind of seeds can you use for winter sowing? Anything that will sprout from your compost pile is a good contender. I’ve had tomato plants and cantaloupe plants show up in my garden where I didn’t plant them– The seeds had been tossed on the compost pile and the seeds germinated where I had spread the compost. Another group of plants that are good for this technique are self sowers. If you have a plant that drops seeds onto your flower bed, and the next year you get more plants growing from those seeds, you should be able to use that kind of seed in winter sowing. That’s just a short list; there are many seeds that can be used in winter sowing. When you’re looking at your seed packet, there are certain words or phrases that indicate it would be a good candidate, according to WinterSown.org. Have you tried winter sowing? What was your experience like? Please leave a comment. Connie, I would definitely suggest putting holes in the bottom of your containers. In the case of heavy rain, you’ll want good drainage. Also, once the weather has warmed up and the seedlings are growing, the soil may dry out a bit, and you will need to open the container and add water, and you will want any excess water to be able to drain away. For vegetables good for winter sowing, I would add any of the cool weather veggies like lettuce, kale,chard and spinach. I would also highly suggest people check out http://www.wintersown.org, this site is giving away several varieties of free seed for just a postage paid envelope. I’m going to try this Connie. Hopefully I will have more luck than I have had starting seeds indoors. The containers that hold rotisserie chickens have domed lids with slits already cut into them. Thank you for your suggestions. When do you replant them? If you leave them in the container they can grow too tall and leggy. Do you repot into small single pots and still cover up ( say it is early May) or can they go right into the ground? Phyllis, thanks for all your help! Linda, those rotisserie chicken containers sound ideal! I hope this works for you. Thank you. I will see how this works out. Thank you for the great article – This is such an easy way for folks to get a jump start on the Spring seeding season, and no electric bills for lighting! David, thanks for the kind words. We probably should note that you might be able to start seeds inside now if you have grow lights and enough space to do it. Great and handy idea, Connie. Great article! I just bought seeds today and cannot wait to plant! With the snow we just received, it’s a great spring start!! Stephanie, you should plant the seeds. If there are directions on the package of seeds, follow the directions. If not, sprinkle some dirt over them. Keep the lid on. The idea is to provide some protection and to have a mini-greenhouse in the early spring. Note that you need to have some holes for air ventilation. Having a big hole, like on the milk jug, allows some rain to get in there, too. I would remove the lid when the plants are tall enough that they are hitting the lid or the danger of frost has passed, whichever comes first. Also, if we get a very warm day, you may want to remove the lid to let heat out so you don’t cook your seedlings. Let us know how this works with the larger containers. Connie — Thanks for the advice — I’m going to sow them tomorrow and keep you posted with the results. Thanks so much for sharing your information — happy gardening! For anyone who is going to try outdoor seed starting right now, I recommend using a fine grade of vermiculite to cover the seeds instead of soil. Vermiculite is a heat expanded silicate mineral that acts like sponges to keep the soil surface moist. It is also sterile out of the bag and helps to decrease incidences of damping off disease [where the seedlings fall over right at the soil surface.] Good luck everyone!! You should listen to David Clark. He’s the expert! David — what do you consider a “fine grade” of vermiculite? Do you have any recommendations for a brand that can be found at Walmart or Home Depot? Vermiculite normally has 3 grades available: fine, medium and coarse. Either the fine or medium grades are suitable for seed coverage. Each garden-center or store may carry a different brand… Hoffman, Black-Gold, Espoma, Green World. Thanks for the information — I can at least make an informed purchase now! How many seeds to you plant? Many, and then separate them out when you plant in the ground or just a few? Lisa, you can do it either way. The seed package should tell you how far apart to space the seeds. Often they will tell you to space them fairly closely, then yank out the extra sprouts. I don’t have the heart to do that. Since you’re not investing anything in the containers– just use old milk jugs and other containers you would normally toss in the recycling bin– and having enough room isn’t a problem because you’re going to set the containers outside, you could space the seeds far apart and use several containers. It’s always better to plant more seeds than the number of plants you want to end up with since some seeds might not germinate. If you end up with extra plants that you don’t need, you can give them away or just throw them on your compost pile. Thank you. We will see what happens in the spring! Still need to collect a few more containers.